Los Angeles to accomodate SpaceX rocket production centre? Elon Musk’s SpaceX entered into preliminary negotiations with the Port of Los Angeles to expand its existing facilities at the port with the aim to construct a manufacturing centre to produce what may become huge next-generation spaceships for missions to Mars. Although neither the port nor the company officials disclose what exactly will be produced at the centre, there are strong rumours that it will be used to manufacture Big Falcon Rockets for interplanetary voyages announced by Elon Musk in September 2017. According to Los Angeles Times, currently, SpaceX leases 8.1 acres (3.28 ha) at the port of Los Angeles for recovery of its Dragon capsules and first-stage boosters returning from space, which arrive via droneships. Now the company seeks to lease an 18-acre site (7.28 ha) on Terminal Island for 10 years, with up to two 10-year lease extension options. Christopher Cannon, Environmental Management Director at the Port of Los Angeles, told the Harbor Commissioners that the proposed project’s site is located at the former Southwest Marine Shipyard developed in 1918. During World War II it employed 6,000 people at the time of its active production operations. Now, the site has been idle “for a long time,” being used for filming. Christopher Cannon noted that none of the site’s historic buildings would be altered or used in the proposed project. The construction would take 16 to 18 months, he said. 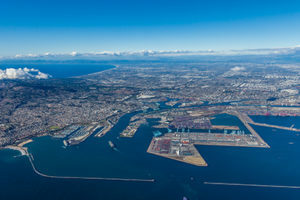 The Los Angeles Board of Harbor Commissioners voted to approve California Environmental Quality Act regulations necessary for the Board to later vote on a lease for the proposed project.